On a hot summer day, a man in a heavy coat sold Tim Prasil a timeworn manuscript of 100 limericks purported to have been penned by Edgar Allan Poe. Prasil has never been able to prove or disprove the true authorship. Is it possible that the often-melancholy Poe dabbled in writing limericks? 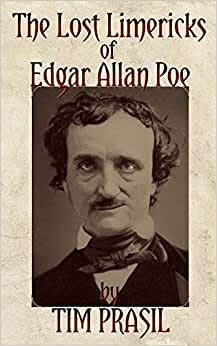 Decide for yourself as you page through these mostly silly--occasionally spooky and serious--glimpses of Poe's work, his life, and his world. The raven was pagin' a "Neville Moore." Tim Prasil (it rhymes with "grim fossil") writes fiction about a ghost hunter named Vera Van Slyke. A collection of these tales, titled Help for the Haunted: A Decade of Vera Van Slyke Ghostly Mysteries, will soon be re-released by Brom Bones Books. The same publisher has already issued Prasil's The Lost Limericks of Edgar Allan Poe, featuring 100 limericks about the great author's work, life, and world. Prasil also edits anthologies. Spectral Edition: Ghost Reports from U.S. Newspapers, 1865-1917 features 150 actual newspaper reports about haunted houses, haunted roads, haunted people, and more. The articles were chosen from Prasil's collection of over 300, all of them published in the United States between the nation's Civil War and its entry into World War One. If you prefer anthologies of fiction, Prasil edited Those Who Haunt Ghosts: A Century of Ghost Hunter Fiction and Giving Up the Ghosts: Short-Lived Occult Detective Series by Six Renowned Authors, both available from Coachwhip Press. You'll find information about Prasil's ongoing Spectral Edition project and his upcoming books at his website: brombonesbooks.com. We should be exceptionally grateful that Mr. Prasil has published this long lost manuscript of undiscovered Poe limericks. There is supplemental background information in the book, which discusses this discovery further—I will not delve into this. What I will say is that these Poe (and other literary-related) limericks are witty and humorous—laugh out loud funny! Each one has been carefully constructed to deliver a punch in just a few lines, while hearkening back to Poe (and, as aforementioned, other literary-related) stories. This book is—these newly discovered manuscripts are—just what the Poe community needs. 5.0 out of 5 starsBuy this book. Quite clever! Will delight any wordsmith, lover of Poe, or lover of limericks. Each limerick carefully, lovingly, and painstakingly crafted. You will giggle and be impressed in turns. 5.0 out of 5 starsPoe aficionados will really like this! Very interesting! Good thing you ran into Bertrum Lucius Zachery Bubb that day. Anyone else might have walked away from the offer to purchase 100 limericks alleged to have been written by Edgar Allan Poe. Very clever, thought-provoking, well-researched, and foot-noted(!) book. Enjoyed every page. Even without the absolute certainty that these mysteriously obtained limericks came from the pen of Poe, the factual and well-researched footnotes alone could serve as their own Introduction To Poe text. I work around teachers, and I caught two of them reading to each other from the book they'd found on my desk, much amused by the content and figuring out how certain ones could have been connected to Poe and his work.